The Alaska Department of Transportation and Public Facilities (DOT&PF) was recently alerted to concentrations of Per- and Polyfluoroalkyl Substances (PFAS) exceeding the state action level for drinking water in the Holy Rosary Church well near the Dillingham Airport. Nine wells were sampled on or near airport property, the others had concentrations well below the action level of 70 parts per trillion for the sum of five PFAS compounds. The Alaska Department of Environmental Conservation (DEC) began initial sampling of private water wells near airport property in December. DOT&PF has contracted with third-party independent contractor, Shannon & Wilson, Inc. to continue the preliminary investigation, which includes an in-depth well search and sampling event. PFAS are commonly used in products for fire suppression, resistance to wear, and repelling oil, stains, grease, and water. PFAS can be found in apparel, some consumer products, and firefighting aqueous film forming foams (AFFF). 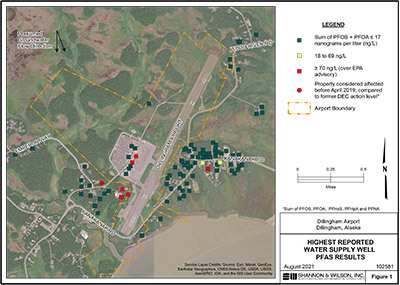 The use of AFFF during firefighting equipment testing at the Dillingham Airport is the presumed source of PFAS contamination in the affected wells. PFAS are considered emerging contaminants and the health effects are not yet well characterized. Shannon & Wilson, Inc. sampled 65 drinking-water wells at residences and businesses near the airport for the presence of PFAS in the groundwater from Feb 26, 2019 through March 1, 2019. PFAS were found in 35 wells, seven of which had concentrations above the DEC action level, including the Holy Rosary Church. Thirty wells had no detections of PFAS. DOT&PF and Shannon & Wilson, Inc. began contacting community members to notify them of their results April 4, 2019. Those who participated in the sampling event will receive a copy of their results at the mailing address they provided. If you have questions regarding sample results please email airportwater@alaska.gov. Community members who utilized the Holy Rosary Church as a drinking water source may visit the Dillingham Senior Center, water is available on the north side of the building, between the hours of 7 a.m. – 7 p.m. to refill their jugs until an alternative permanent water solution has been established at the church. Community members whose private wells exceeded the DEC action level have been provided an alternate water solution.